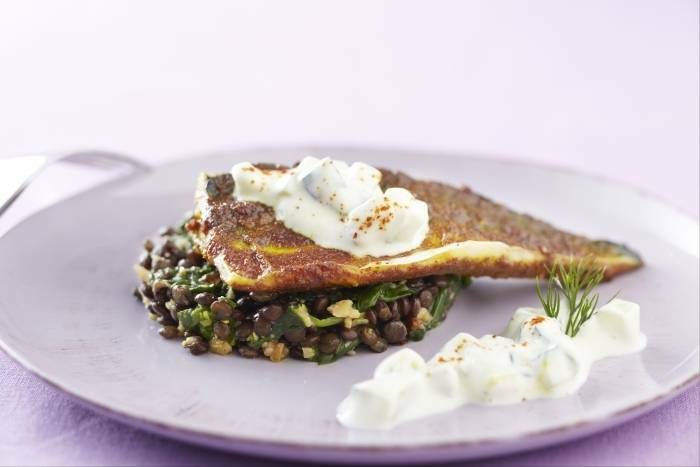 Baked mackerel fillets cooked in a gentle blend of spices served on a bed of lentils, green chilli and spinach with a fresh cucumber raita. Fillet the mackerel if necessary and remove the pin bones using fish tweezers or a filleting knife. Mix the ground spices and the chilli powder with the vinegar and the oil. Once combined, rub the spice mixture on to the mackerel fillets. Place the fish on a baking tray skin side up, transfer to the oven and cook for 6-8 minutes. Place the lentils in a pan of cold water, bring to the boil and cook until tender. Peel and dice the shallot and the garlic. Finely dice the chilli. Crush the peanuts. Heat a frying pan to hot and then add the shallots and the garlic until golden brown. Add the chilli, crushed peanuts and the vinegar followed by the lentils. Season with salt and stir well before folding in the spinach. Cut the cucumber in half and scoop out the soft centre. Cut the cucumber into small dice and then mix with the yogurt. Season with salt and pepper and keep chilled until ready to serve. Use a stainless steel serving ring to plate the lentils. Place the mackerel on top of the lentils and then add the cucumber raita to finish.